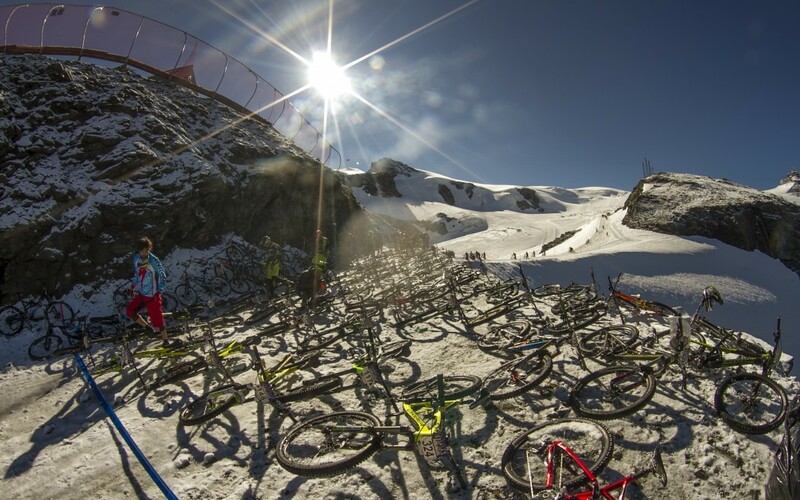 Cervinia Valtourmenche Bike Park teams have been working hard since the snow melt. The majority of the biking trails have been rethought and reshaped for the pleasure of the 300 riders awaited at the start of the Italian venue of the Maxiavalanche Europ Cup 2016 on July 30th and 31th. After the first venue of the Maxiavalanche of Vallnord Andorra, and the famous MEGAVALANCHE of the Alpe d’Huez, the Elites and amateurs of the Mass Start race format will discover or rediscover the beautiful trails that the Transalpine resort of Cervinia offers at a 45min drive from Turin. The fame of the welcoming, the accommodation and the restauration of this area of the Aoste Valley is second to none, without forgetting the breath-taking scenery: these are good reasons to go on an Adventure with friends or in family! The Highlight of the Maxiavalanche Cervinia is the Start at 3500m elevation on the glacier of the Plateau Rosa, skiable even in summer, surrounded by summits culminating at 4000m high, as the alpinist reference that is the Cervin. A beautiful blank canvas where Pros and Amateurs make their path for more than 10 years now, in a vibe still as sporting as friendly. The Maxiavalanche Europ Cup is raced on 2 runs on the Sunday: The qualification day of Saturday allows to allocate riders in their respective level group and to determines the starting position of each one of them for Sunday. The starts for this type of race are particularly impressive considering that start lines are composed of 20 to 30 riders, for a group of 100 to 150 each time. Looking at the course configuration that is mainly downhill oriented, the first parts of the race required a lot of determination and nerve control facing this neck-to-neck situation on the first obstacle bits. A 20 minutes Sprint is necessary to overcome the qualification and 25 minutes for the race runs, in which all obstacles and turns need to be manage in the best possible way. 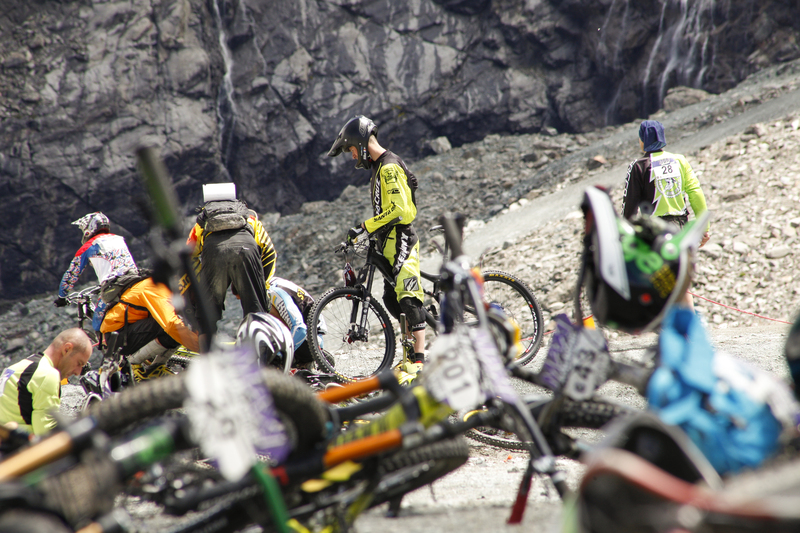 – Nico Quere (Commençal) is the man to bring down since is race victory in Andorra. – Youn Deniaud (Devinci) is also one to watch out after his second place behind Quéré. – Dimitri TORDO coached by Karim AMOUR, multiple time winner of the Maxiavalanche Cervinia and 4th in Vallnord this year. – Baptiste GAILLOT (Yeti) always feeling comfortable on such race format (3rd in Vallnord, 9th at the Megavalanche Alpe d’Huez 2016), 4th overall for the TEMS by Continental, 4th at the Maxiavalanche Cervinia 2015. Other athletes will fight for a podium, such as Charles Clément, Remy Durand, Jérôme Gilloux. Representing Italia on their home soil, Elio Begnis (Scott), Sandro Alfeo (Rose), Andrea Girodo Sonio, Fabrizio Grance, Gianadrea Lecco et Ivan Lenardon will be at this summit appointment, and with no doubt are looking for a top spot result. In the women’s field, it is Estelle Charles (1st at the Maxiavalanche Vallnord 2016) that is placed as the race favorite, followed by Emilie Serre and Nastasia GIMENEZ, respectively 2nd and 3rd in Vallnord. From away, the Russian Ivan Malakhov (Focus) can also make the surprise! The Maxiavalanche remain an event reserved to the specialists and amateurs: for those lasts, the MAXI CHALLENGERS offers them the chance to express their talent in their corresponding level of racing. This year will also mark the fifth and last stage of the Ebike Serie by Moustache; category reserved for the e-bike enthusiasts. After a convincing experience with the E-bike (out of the E-Bike serie) at the Maxiavalanche Vallnord, the electric lovers will have their own start, strictly as the other racers of the Maxiavalanche on the beautiful trails of Cervinia! A race where the rider skills and power of the bike matches perfectly. A last stage mainly downhill oriented, as the one that occurred at the Megavalanche 10 days ago, that shows the riders skills and makes appreciable the electric engine when comes the pedal sections and when exiting turns ! We would like also to remind you that Cervinia being part of the Trophée Enduro Mass Start (TEMS) By Continental have a high coefficient, a way to disrupt the actual overall standing that is tightened between Remy Absalon (absent of the Maxis), Dimitri Tordo, Nicolas Quere, Baptiste Gaillot and Charles Clément, that will all be present and that are regular racers of this Maxiavalanche Cervinia.